We’re only on Day 5 of the 2016 Olympic Games in Rio, and Team USA has been rocking it! We’ve won another Gymnastics Team Gold, and our swimmers like Katie Ledecky and Michael Phelps are absolutely crushing it. 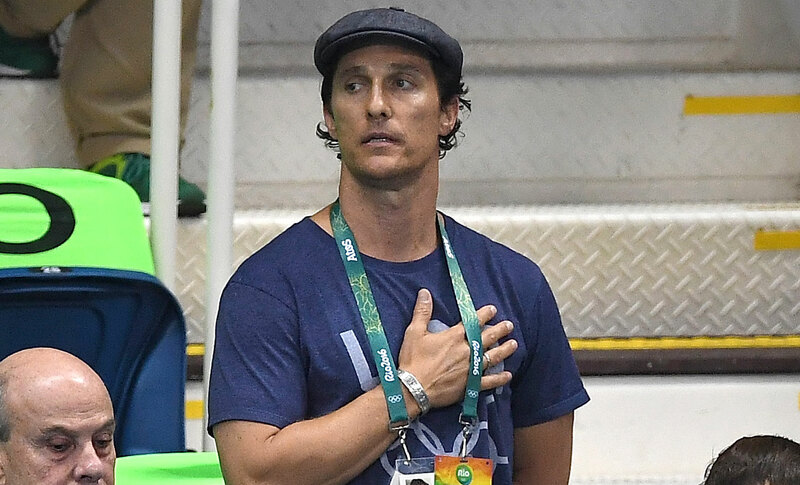 Unfortunately, most of us have to sit at home and cheer the USA from afar, but Matthew Mcconaughey is there, and he is supporting Team USA for all of us. Mcconaughey was spotted all over Rio yesterday, cheering on Team USA. He was up on his feet watching the swimming finals, and rocking his USA spirit on his shirt! His reaction to seeing Olympic swimmers in real life is priceless. He popped by to check out some Olympic Rugby, because he’s a true fan. Rugby hasn’t been at the Olympics since 1924, but now that Matthew’s a fan, we bet it becomes one of the world’s most popular sports. I mean, this makes us want to be on the Rugby team. Matthew Mcconaughey is oozing ALL the patriotism! He stopped by to chat with Ryan Seacrest in yet ANOTHER amazing USA shirt. Then he showed off some of his newfound rugby moves. He was also spotted watching a little Team USA Beach Volleyball. Clearly Matthew knows we’ve got this Olympics locked up.